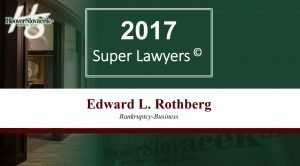 Edward L. Rothberg is the head of the Hoover Slovacek bankruptcy practice and has been practicing creditor’s rights and bankruptcy law for the past 36 years. Prior to entering private practice, Mr. Rothberg was a trial attorney with the Department of Justice, Tax Division where he represented the IRS in some of the largest bankruptcy cases in Texas including Braniff and Continental. In practice, Mr. Rothberg primarily represents debtors and equity holders at every stage of reorganization, both in and out of court, and in Chapter 11 business reorganizations. Additionally, Mr. Rothberg specializes in resolving tax problems in bankruptcy and related adversarial matters in which creditor rights are being contested. With respect to debtor work, Mr. Rothberg has represented a wide variety of debtors, and has been successful in restructuring debt both inside and outside Chapter 11. In 2016, Mr. Rothberg won the Large Turnaround of the Year Award issued by the Chicago Chapter of the Turnaround Management Association for the out of court workout of the CECO Pipeline Company. With respect to Chapter 11 cases, Mr. Rothberg has confirmed Chapter 11 plan in over 33 different cases in a wide variety of industries including, oil and gas, healthcare, real estate, construction distribution, manufacturing, retail and business services. It has long been Mr. Rothberg’s practice to ascertain the financial condition of the client and attempt to restructure company out of court. Financial restructuring, whether involving negotiating with secured creditors and critical vendors, a sale of assets or merger, or for a change in ownership usually results in a win-win situation. These companies are able to continue operations while protecting the positions and livelihoods of multiple stakeholders: including principles, lenders, employees, vendors, and investors, without the high costs associated with a Chapter 11 filing. The filing of a Chapter 11 bankruptcy case is generally used as a last resort or for a specific strategic purpose. Mr. Rothberg represents creditors, debtors and equity holders at every stage of reorganization, both in and out of court, primarily in Chapter 11 business reorganizations. Additionally, he specializes in resolving tax problems in bankruptcy and related adversarial matters in which creditor rights are being contested. With respect to debtor work, Mr. Rothberg has represented a wide variety of debtors and has been successful in restructuring debt both inside and outside Chapter 11. By not limiting the firm’s practice to either debtor or creditor work, Hoover Slovacek is able to maintain a more neutral perspective and to predict the opposing side’s reaction to a particular strategy. Named to Texas’ Best Lawyers list, Bankruptcy, 2007-2014, 2017, published by Woodward White, Inc.
Mr. Rothberg has spoken at numerous seminars and is the author of the following legal articles: Secrets of Successful Out of Court Debt Restructures; Utilizing a Jury Demand to Obtain Leverage in a Preference Case; The Claims Estimation Process: A Valuable Tool for Obtaining Plan Confirmation;Representing the Unsecured Creditor; The Impact of Bankruptcy on Intellectual Property License Agreements; What Lenders Need to Know about the New Article 9; The Discharge of Tax Claims in Bankruptcy; Resolving Federal Tax Problems in Bankruptcy.